The minimum wage is one of our country’s most controversial topics. In recent years, workers advocating for a raise have brought the subject into the national spotlight. Three major cities—Seattle, San Francisco, and Los Angeles—have voted to phase in a $15 minimum wage over the coming years. Contrary to what advocates for raising the minimum wage to $15 believe, it will not have a favorable outcome. It will result in an obvious initial boost in low-wage workers’ pay, which will be followed by substantial job loss and increased consumer prices. Do the math. Let’s say there is a restaurant that employs 15 workers, and pays them Virginia’s minimum wage of $7.25 per hour. If they all work normal hours, it takes $4,350/week to pay them all. 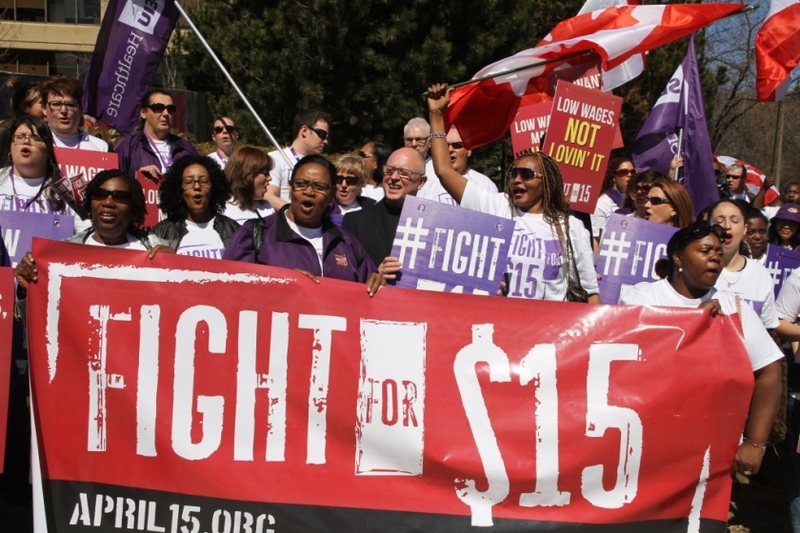 If the minimum wage were raised to $15 that weekly cost of $4,350 would rise to $9,000. That would give our restaurant an additional yearly cost of over $240,000. A great deal of small business owners don’t even make that annually. Now, this specific scenario doesn’t necessarily apply to businesses everywhere, but the same principles do. Many businesses will not be able to afford this increased cost. Furthermore, a great deal of the businesses that would be able to handle that increase would not prefer to do so. In order to continue operating, businesses may increase the prices of goods and services they offer, lay off employees, and increase the workload of the remaining workers. Back in May, San Francisco began the process of implementing a $15 minimum wage by immediately raising it to $12.25—a 14% increase. Chipotle proceeded to raise the prices at their San Francisco locations by as much as 14.4%. Businesses are always looking to terminate redundant tasks. Various practicable forms of automation technology are just around the corner. A touch-screen computer will soon replace the process of verbally ordering your Big Mac. Your local Taco Bell cashier will soon be swapped for a small, compact device where you punch in your order and swipe your credit card. If a $15 minimum wage were put into place, a significant amount of businesses will not hesitate in replacing certain jobs with this technology. After all, many won’t have a choice but to do so. Some studies state that an increase in the minimum wage would increase employment, while others concluded that it would have the opposite effect. This lack of consensus means we have to resort to common sense and logic. A $15 minimum wage will only make it harder to attain prosperity. Our country is the land of opportunity. If you work hard, it is very likely that you will be rewarded. While the path to higher wages does not entail raising the minimum, please take heart in the fact that your current occupation is merely a stepping stone in your journey of life—by no means is it the final destination. Life is what you make of it. Make something good. Michael DeFazio is a fourteen-year-old homeschool student from Northern Virginia, who works part-time in the electrical construction industry as well as writing for American Individualists. American Individualists is a political education organization located in Purcellville, VA. Founded by teens in 2013, the group provides a forum for political education and activism opportunities for young people. The group meets weekly at 5pm at the Purcellville Library. To learn more about American Individualists and its mission, visit www.americanindividualists.com.